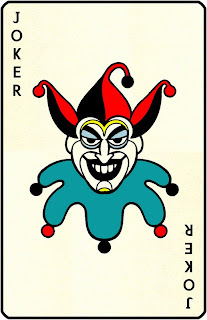 I've always thought it would be cool to quill a joker... you know, the playing card kind with the zany hat... the bright outfit... and the silly expression. and a prancing drum major with a baton... or maybe it's a back scratcher? 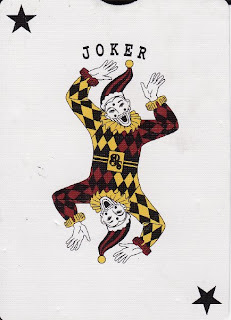 This fellow is downright scary - he has to be the one that inspired the Batman creative team. I know the blue thing is a collar, but what I'm seeing instead is a big head, no neck, and a little crouching body down on all fours... er, fives, ready to spring. 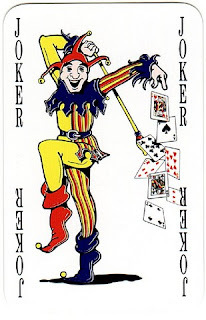 A Viking clown? The antlers are a great touch. 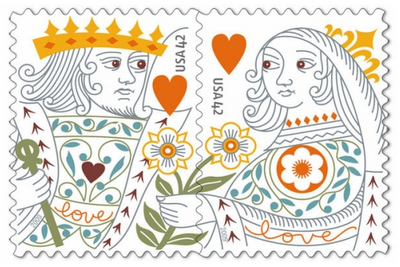 Lo and behold, look at the new love stamps just released by the U.S. post office - the King and Queen of Hearts! 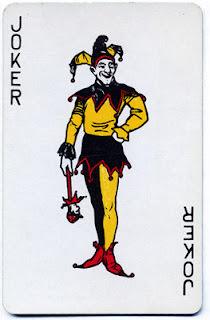 (They're what reminded me of my yen to quill a playing card joker.) And she's an equal opportunity kind of gal, presenting him with flowers. Go sistah! He looks wary, she looks tentative .... I could write a story... but let's get on to the contest and candy! Can I interest you in trying a king and/or queen design in paper filigree? Let your imagination go wild... your interpretation doesn't have to look just like the stamps. Email me a JPEG by May 31 of what you come up with so that I can share it here. Find my addy on my profile page; just put Blog Candy Entry in the subject line. I'll let you know I've received it. A judging panel of me, myself, and I will pick a favorite on June 1... or if we simply can't decide, then we'll go with an even-steven drawing. There are some very nice treats in it for the winner - a brand new copy of the latest issue of CardMaker magazine and some great paper supplies. To show you an example of using a stamp as inspiration, here's something I made as a design team project a few years ago when I saw the 2006 wedding stamp... I knew at first glance that the design was potentially quillable, so I gave it a shot. Not my best work ever, but I had a great time replicating the free-flowing design with metallic bronze and gold quilling strips on edge. The background paper is pretty busy, but I remember thinking its design reminded me of bird feet. The 2009 wedding cake stamp is another one that would work well as a quilled design... look at all the scrolls! But for right now, just focus on quilling the King and/or Queen - I can't wait to see what lands in my inbox! I have always loved your stamp interpretation and think you are one of the best at spying designs and adapting/interpreting them in paper filigree. I tend to always be looking at what unusual things I can use as a base for my quilling - unusual mounts. You keep an eye out for interesting designs in other media to re-interpret. I hope you will share all the designs and projects that are submitted, Ann. Unfortunately, I won't be one. No quilling time for me yet - but you'll be happy to hear that my studio is clean again. That's the first step to coaxing my muse out of hibernation! Thanks ladies. I definitely plan to post pics of the entries - hope there will be some! What i discover difficult is to find a weblog that may seize me for a minute but your weblog is different. Bravo.